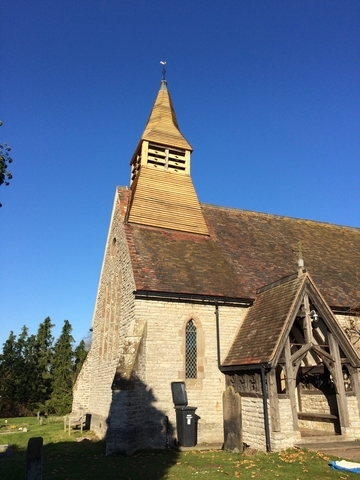 Tibberton church is looking resplendent again with a new oak cladding to its iconic wooden steeple. It is 2 years since we were awarded a grant from the Listed Places of Worship Fund. Now finally the church is looking great again with the steeple restored to good order. And the good news is that we did not have any water leaking into the church during the winter storms! While the work was going on we also took the opportunity to re-route the electrical supply. So instead of going overhead and onto the Chancel wall the supply now runs underground and enters the church in the south west corner near the porch. We then moved the internal electrics so instead of being in full view on the wall in the chancel they are now placed discreetly above the kitchen area. During the restoration of the spire there had to be some repairs to the internal ceiling. 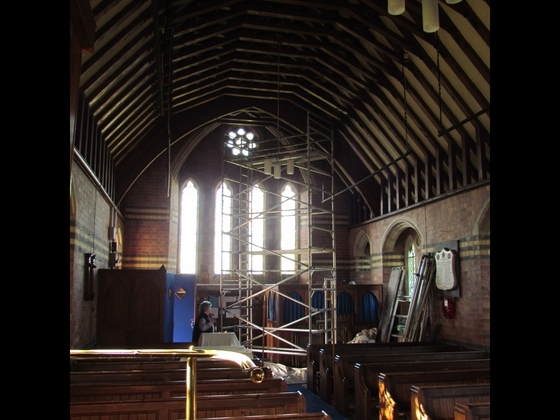 This meant removing the three back rows of pews to get the necessary scaffolding in place. We have decided to experiment with the 'free' space this created by leaving the pews out for now. The space at the back of the church has already been used for a Christmas tree and decorations, displaying a plough on Plough Sunday and now with child-sized seating and books. Work in progress on the steeple. 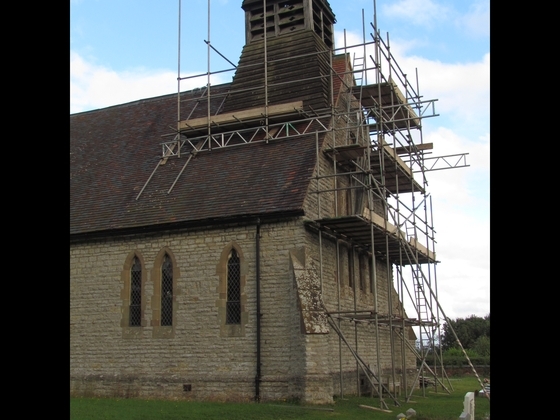 First job was to erect the scaffolding. 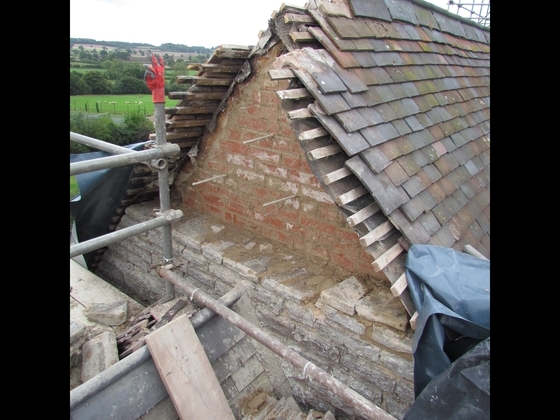 This picture shows restoration of the brickwork on the gable end between nave and chancel. The original brickwork is up to 1 metre thick! To complete the work repairs had to be carried out to water damaged sections of the ceiling.